Support World Animal Day - buy your gear today! We are delighted to announce that www.sweetfirebrand.com is raising funds to help power the World Animal Day movement. 100% of the proceeds from the World Animal Day 2015 Tees, Totes and Iron-on Transfers will be donated, plus 15% of proceeds from all other purchases. Planning a group event for World Animal Day? 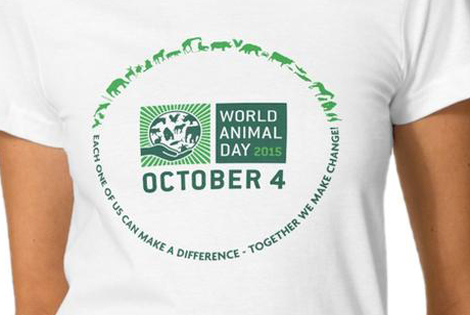 Download a digital file of an official World Animal Day 2015 Design and make your own apparel with iron-on transfers - an economical way to represent a unified movement. Sweet Firebrand was recently launched by Delia Bonfilio who designed the new World Animal Day logo. We are most grateful to Delia and Bonfilio Design for their continued support. It’s official - The World Animal Day movement gains momentum each year!